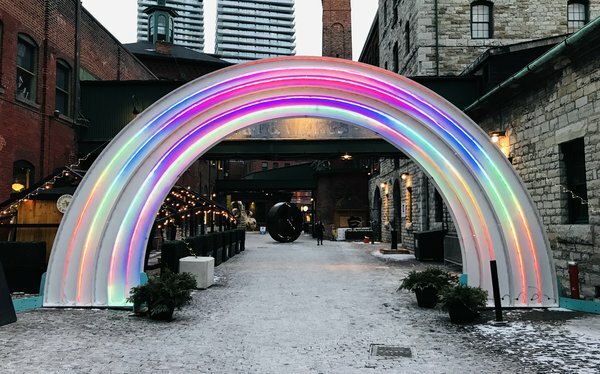 The Toronto Light Festival is back for 2019 and has taken over the gorgeous historic Distillery District from now until March 3, 2019! The free Toronto festival created by Mathew Rosenblatt and friends brings sculptures from Canadian and international artists to inspire exploration and fun during our coldest winter months. 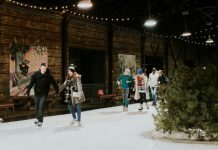 Their programming has expanded this year to include some daytime activities, which is perfect for anyone looking for some family friendly winter adventures. 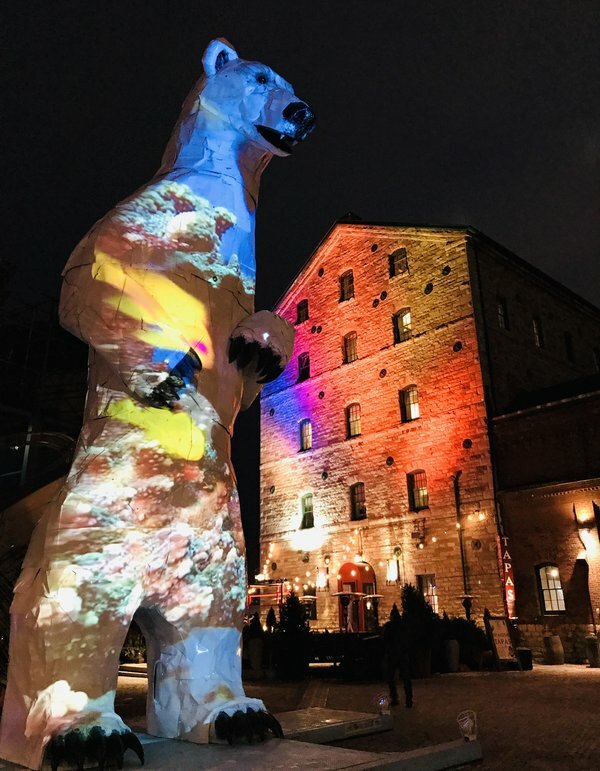 If you didn’t attend last year and feel like it’s way too cold to just walk around outside checking out (world renowned, larger-than-life, and some interactive) works of art, just remember that many of the Distillery District buildings include cafes, restaurants, and artists studios! You can step inside and check out some of the local shops while warming up! 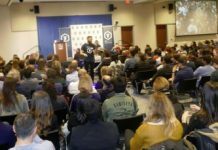 That’s really why I’m a fan of this festival, because you’re surrounded by working spaces for some of Toronto’s most creative designers and artists. 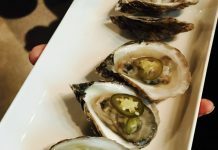 Torontonicity was invited for opening night on January 18, 2019, and attending guests were treated to some delicious eats courtesy of the Distillery Events team. It was almost -20°C that evening, so many went straight for the French Onion Soup to keep them warm: beef broth, with caramelized onions, and grated mozzarella that was then hand-torched. I couldn’t resist and went to dessert first: a warm and freshly made chocolate churro! I had two. 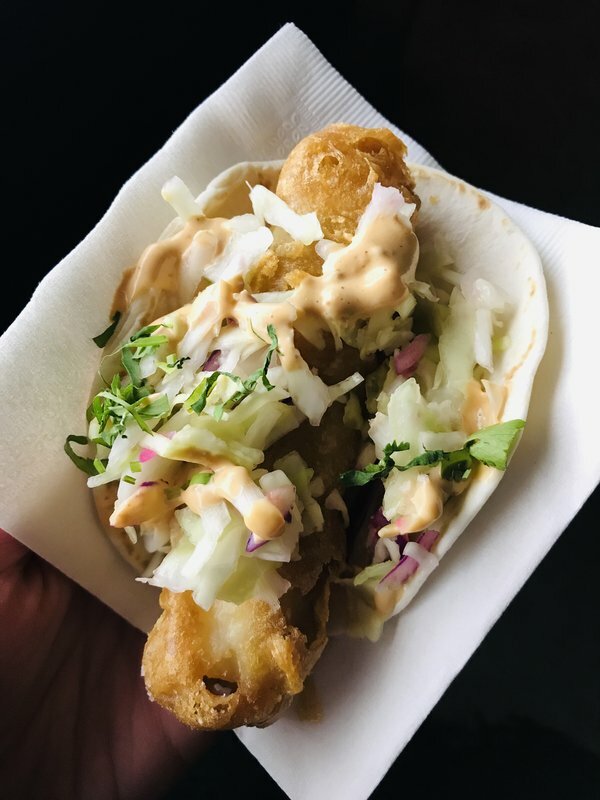 Another popular bite was the Baja Fish Taco that came with a house slaw and spicy aioli sauce. These were hard to get a hold of as they flew off the tray as soon as they were brought out! Before heading out, I grabbed a mug of mulled red wine but noticed that many were going for the Cherry Noir and signature Toronto Light Fest Glowing Orange cocktail. 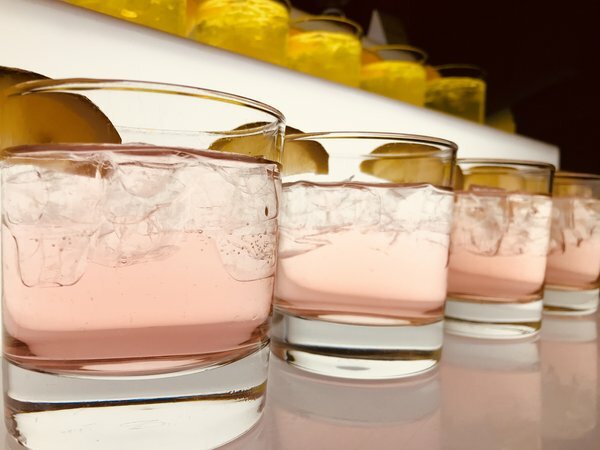 If you aren’t familiar with the cocktail, you can read about my 2018 experience with this black-light reactive cocktail, check it out here. Now that I was warm and toasty, I ventured out into the night with our tour guides, Erik and Mathew himself! There are so many visually impressive works this year, so I’m going to highlight the ones I enjoyed the most and think shouldn’t be missed. I’ll even include a tip for how not to miss any sneaky or hidden sculptures! 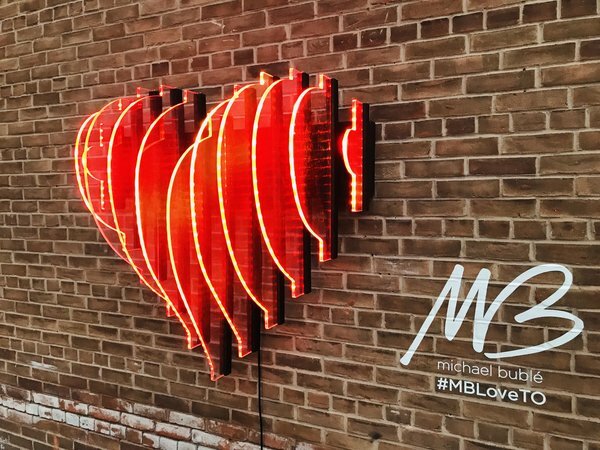 To start, I absolutely need to talk about Michael Buble’s “(Love) Edge Lit Heart” by Craig Small, a Toronto-based artist who used animated LEDs to bring eleven acrylic panels to life in a mesmerizing warm glow. The piece looks beautiful day or night, and if you’re in the area around sundown, take a second loop around to see it after dark. There’s one cycle where the heart looks like it’s beating. Right next to Craig Small’s piece is “The Phoenix Rainbow”! It was created by a collaborative group (by the same name) that’s based out of Victoria, BC. This group of artists, engineers, and programmers used over 2 tonnes of aluminum and steel, and over 152 metres of addressable LED lighting (in RGB) to create the smile-inducing sculpture. It’s hard to miss, and even harder to walk away from! Even harder to miss is the 10.6-metre-tall illuminated polar bear in the middle of the Trinity Street plaza, titled “Long View” and created by Don Kennell. The piece was created using old car hoods and is intended to remind us of the devastating impact of climate change. Make sure to see this piece at night as the projected video isn’t as visible during the day and is essential to the message. 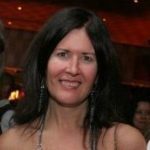 One piece that you may need to line up for is Crispell Wagner’s “Strange Attractor”. This cylinder is meant for someone to be spun while someone stands inside. The experience is disorienting, but super fun, so if you’re into having your entire field of vision filled with colour – do it! Warning: the dizzy feeling may be too much if spun too quickly, so ask a friend to start spinning slowly and then go from there. Directly across from Strange Attractor is “Enunciation” by Taylor Dean Harrison. This stainless steel and acrylic work is meant to reflect its surroundings on the exterior, but has an inviting tent-like interior. 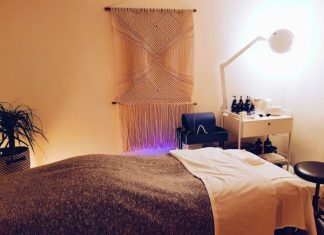 The lights have been programmed to range from warm to cool tones, and pastels to vibrants, so you may need to check this one out for a minute. Trust me, get inside. You probably need to warm up at this point, and thankfully, directly south of Enunciation is the Heat Lamp Forest! The heat lamps have been illuminated with green lights, so from afar it really does look like a forest. This area will have a small bar that’s open to 19+ guests in the evening but is warm enough for everyone to take a break and warm their hands before heading back to see more works. Alright, as promised here is my tip for not missing any sculptures at this year’s Toronto Light Festival: look up. I know, it sounds simple, but you really will miss some sneakily hidden works if you just stick to what’s directly on your path. One example of this is the return of The Guardians of Time by Manfred Kielnhofer. If you manage to find some of the other hidden works, let us know by leaving a comment down below! 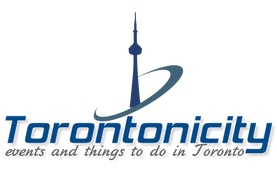 Alternatively, if you think a piece deserves more attention and want other Torononicity readers to catch it, also leave a comment. 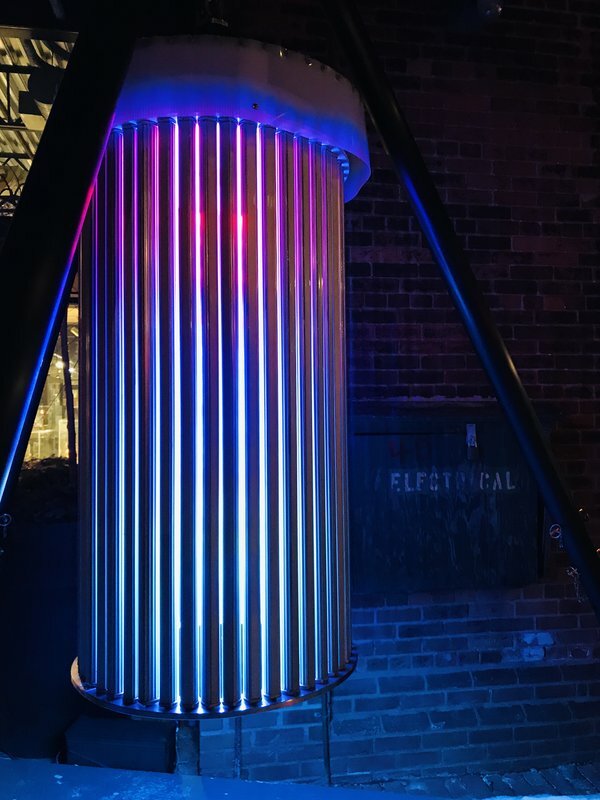 The Toronto Light Festival 2019 is on until March 3, 2019, so make sure to check it out! Stay warm, and enjoy! Looks like a cool thing to experience! I love light festivals! I think I’d spend all my time in the heat lamp area. It’s so cold right now I wouldn’t want to venture far from it! This looks like a great experience and that fish taco looks just about perfect. 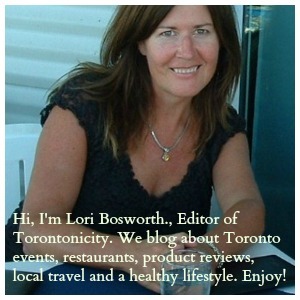 The next time I am in Toronto I need to experience The Distillery District! The food alone looks amazing!